Downtown Delaware brimmed with the Christmas spirit during December’s First Friday. Trumpets could be heard up and down Sandusky Street as musicians played the familiar songs of Christmas and the crowd gathered around for the lighting of the community Christmas tree. 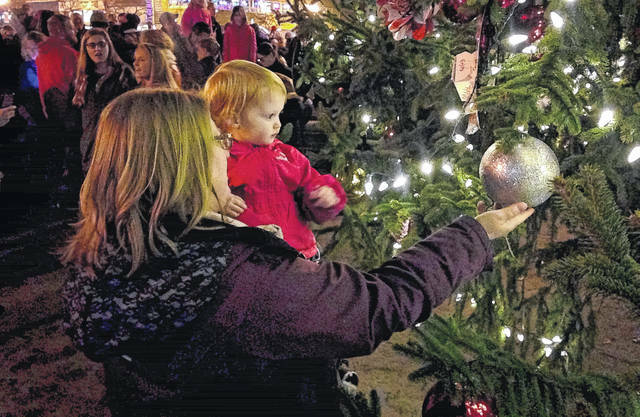 Right at 6:30 p.m., the lights of the tree were lit and immediately caught the eye of Adelynn Greer who was getting a special up-close look at the tree with her grandmother, Mary Evans. The 2017 Christmas parade is scheduled for 3 p.m. on Sunday in downtown Delaware. For information about holiday events this weekend, go to www.mainstreetdelaware.com.